Tandem partnered with hotels close to the school in order to provide students with a higher category of accommodation. Good value for money hotels. Located in the center of Madrid, just a short walk from the Prado, Thyssen-Bornemisza and Reina Sofía museums and the Puerta del Sol, Plaza Mayor and Gran Vía, and close to the Atocha Renfe-AVE train station. The theme of the hotel is Spanish wine regions. All rooms have air conditioning and a flat-screen satellite TV. The hotels are just 5 to 10 minute walk from the school. 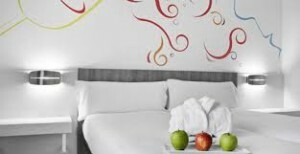 The standard of hotels in Spain use to be outstanding, you’ll can enjoy a very pleasant learning travel experience. With private bathroom, phone, TV, breakfast; very close to the school. * If you need more information or a personalised quote, please contact us. Please check also the other types of accommodation we offer.